Sarwat Chadda's Blog: Guest review from my mate Cameron! I'm one of those who wished he knew the weirding way, that his eyes were blue in blue and, god-damnit, wanted to be a Fremen. 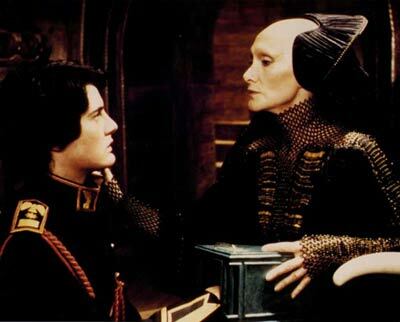 But... some time ago I got into a twitter chat with LdySkyfire and recommended she read Dune, and watch the movie. The review below is teh result. Just for fun, folks! This Hugo & Nebula Award winner tells a sweeping tale of the desert planet Arrakis, the focus of an intricate power struggle in a byzantine interstellar empire. Arrakis is the sole source of Melange, "spice of spices". Melange is necessary for interstellar travel & grants psi powers & longevity. Whoever controls it wields great influence. Troubles begin when stewardship of Arrakis is transferred by the Emperor from the Harkonnen Noble House to House Atreides. The Harkonnens don't want to give up their privilege. Thru sabotage & treachery they cast young Duke Paul Atreides out into the planet's harsh environment to die. There he joins the Fremen, a desert dwelling tribe, the basis of the army with which he reclaims what's rightfully his. Paul is more than just a usurped duke. He might be the end product of a long-term genetic experiment to breed a superhuman. He might be a messiah. His struggle is at the center of a nexus of powerful people & events. Repercussions will be felt throughout the Imperium. I will be honest; I’ve known about this book’s existence for years, but never had any interest in reading it. In fact, I have gone out of my way not to read it because I’m generally not a big fan of straight science fiction. However, when author Sarwat Chadda told me in a tongue in cheek way to read this book else our friendship would be in jeopardy, I decided to give it a try. Generally when I get a challenge like that, I follow through on it. So what were my thoughts on this book upon finishing it? Well it was an interesting read. While I liked various parts of it, other parts were just boring. And yes, perhaps my dislike of straight science fiction clouded my feelings and made it impossible to read with an unbiased eye, but in the long run, the book just simply didn’t do much for me. The ideas behind the Bene Gesserit teachings and the Fremen way of life I found immensely intriguing. The Litany against Fear especially caught my eye and left me thinking. In truth it was the thoughtful, intellectual moments in the book that were the most enjoyable for me. Herbert poses some truly deep philosophical ideas within this novel and those ideas held my interest far more than the actual plot of the story. Try as I might, I just didn’t care what happened to the characters or the power struggle between political houses. And once Paul became the “messiah”, I lost what little respect I felt towards him. At the same time, I struggled with Herbert’s writing style. To me it was dry and extremely confusing. The general pacing of events took far to long and often times I found myself wanting to scream, “Get on with it already!” Not that that would have done much good. In fact, by the time I finished with the story itself, I chose to completely skip the appendices and glossary. Plus, the inner monologues just killed me. Almost all of Herbert’s characters engage in inner contemplation to the point where it was overkill. Yes, Herbert created a world that truly was unique, however the actual story just didn’t work for me. I’ve heard that it has been compared to Tolkien’s Lord of the Rings trilogy, but if I had to choose between the two, I’d go with Tolkien long before I’d ever choose Herbert. Thank heaven’s I listened to the folks who told me to read the book before I watched this movie. Had I gone the other way around, I fear I would have been completely lost. Never in my life have I seen a movie more disjointed in its telling then this one. It felt like there were no transitions between major events, and the few transitions that were there were flat and poorly explained. The use of the inner monologues, which run throughout the novel, were poorly dubbed and did little to enhance the plot. And the portrayal of the Harkonnen Baron was disturbing to say the least. In truth, the first time he appears in the movie, I had to fight the overwhelming desire to turn the TV off. True, the actual character in the book is not entirely mentally stable, but to physically see that instability depicted in a movie is just beyond creepy. At least with Sting’s character it was more a matter of physical appearance then actions. Sting has a truly wonderful psychotic facial expression through the movie. For a movie that was produced in 1984, the special effects were well done. Nowadays most folks would consider the quality of the effects cheesy, but the depiction of the shield-filters worked well with what I had envisioned them to look like when I read the book. I will admit that the space creature who was responsible for folding time and space made absolutely no sense to me. I couldn’t figure out what it was suppose to be and at this point, I don’t think I want anyone to try and explain it because it will more than likely just make my brain hurt. The best bit of casting, besides Sting as the deranged Feyd-Rautha, was Patrick Stewart as Gurney. I only wish there had been more of him as I really liked his portrayal of the character. So, if you are considering watching this movie but don’t know anything about Dune in general, I will offer the same advice that folks gave me, read the book first. Trust me, it will make more sense in the long run if you do.